To expose the capture of wild monkeys for experiments, our Field Officers infiltrated a South American gang of trappers. We caught on film owl monkeys being torn from the trees and followed them to a laboratory in Colombia where they were used in malaria experiments. Our footage has been screened in the European Parliament and Colombian Congress. Yet, in April MEPs voted to cut European Commission proposals to end the capture of monkeys by lab dealers. Although these particular monkeys were not destined for Europe, this is the type of wild capture that Europe sanctions. It can be a lonely and risky business for our Field Officers as they gather the evidence so vital for our campaigns. Sitting in a canoe, in pitch darkness, quietly slipping up the Amazon in the dead of night with a group of monkey trappers is probably as isolated as it gets. The trappers are local people. Typically, they are poor and not recruited for their welfare, environmental or conservation knowledge. They qualify by being able to find and catch monkeys, cheap. The trappers go where they can get access to monkeys – there is no evidence that they consider sustainability or the stability and health of the wild populations as apologists might claim. 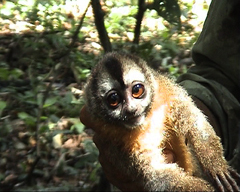 The trappers are in search of owl monkeys which are nocturnal. Our Field Officer switches on the nightvision camera. The trapper in front of them has a huge machette to hack through the undergrowth and is tapping the trees to force the little monkeys to stir. There have been a number of reports of considerable damage to the forest with trees being chopped down to get to families of owl monkeys. Later, we filmed the monkeys being captured. The trapper scaled a tree and placed a net over the hollowed trunk where the owl monkeys were sleeping, leaving no escape. The monkeys are then grasped and carried to the ground. The terror is evident in their faces as they are pushed, screaming, into sacks. From here they are taken to a dock, put in holding crates and taken up river to the Colombian Immunology Foundation laboratory (FIDIC) in Leticia run by Manual Elkin Patarroyo. Readers will be familiar with our campaign in Colombia to end these cruel experiments. Inside the laboratory, the monkeys’ forest is replaced by the barren factory-type cages. Some are isolated, which is torture for a monkey. We also filmed the poor monkeys being experimented on. The IUCN has announced that 48% of all primate species are either endangered, or critically endangered. As governments in the home range states of primates make desperate efforts to prevent the poor and hungry eating some species to oblivion, the western research community demands the right to take them for unreliable experiments, when alternatives are available. An estimated 10% of primates in EU labs still come from the wild and the EU is utterly complicit in the capture of wild monkeys by dealers. It is imperative that the European Commission’s proposal to end the wild capture of primates for research and breeding programmes are supported by the UK Government at the Council of Ministers.